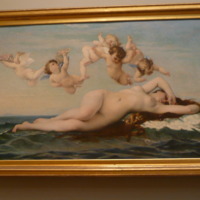 The first version of Cabanel's Birth of Venus (Musée d'Orsay, Paris) created a sensation at the Salon of 1863, which was dubbed the "Salon of the Venuses" owing to the number of alluring nudes on view. Embodying the ideals of academic art, the careful modeling, silky brushwork, and mythological subject of Cabanel’s canvas proved a winning combination: the Salon picture was purchased by no less than Napoleon III for his personal collection. In 1875, John Wolfe commissioned the present, slightly smaller, replica from Cabanel. Alexandre Cabanel (French, Montpellier 1823–1889 Paris), “The Birth of Venus,” Mapping Mythology: A Digital Collection of Classical Mythology in Post-Antique Art, accessed April 22, 2019, http://www.mappingmythology.com/items/show/91.